The 2018 Limestone Heritage Festival Parade theme is "Lawrence County - Celebrating 200 Years." 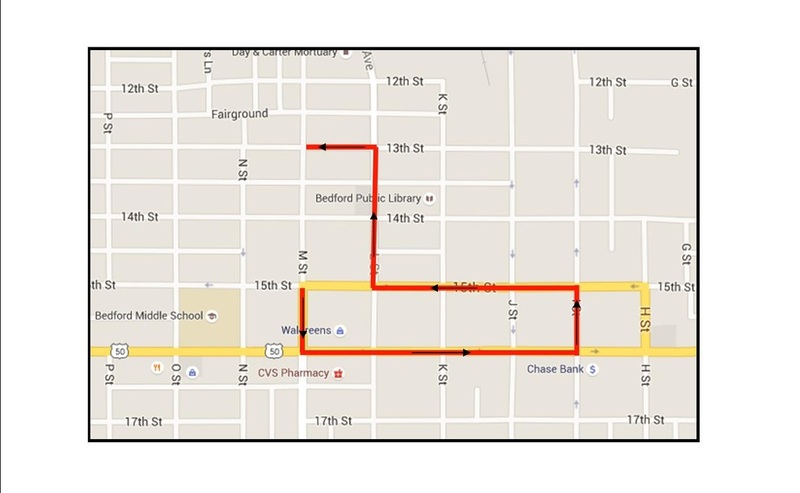 Bring a chair and enjoy the parade along the route marked in red. Enjoy Food Trucks & Vendors on the J Street section of the Downtown Square. Our Festival vendors are located on J Street in between 15th & 16th Street. Stick around for the LIVE entertainment by Soul Street, on the Harp Commons Stage starting at 8pm. Then the FIREWORKS DISPLAY at dusk! All entries must adhere to the parade guidelines as indicated below. ​1. No parade unit will be allowed in the parade line-up without a properly completed entry form. 2. No sirens or other forms of horns that emit loud piercing sounds will be allowed during the parade. 3. All parade units must be decorated according to the Parade theme or Patriotic theme. See 3A and 3B for additional information. 3A. If a generator is being used to provide power to run the entry, 16/3 AWG (min size) power cords are required, and please be sure to have extra fuel in an approved container on your float or towing vehicle. An approved ABC fire extinguisher will be required. A Fire Marshall will inspect all entries using a generator during the lineup. Those not complying with this safety precaution will not be allowed in the parade. For safety reasons, do not attempt to refuel your float while it is in motion or during the parade itself - refueling is permissible only before the start of the parade. 3B. An approved ABC fire extinguisher is required for any float or other entry using gasoline or other flammable substance. 4. A clearance shall be maintained around equipment that gets hot when running for the following: ordinary combustibles (paper, wood, plastic, etc.) of not less than three (3) feet and not less than ten (10) feet for approved fuel containers. 5. Anything deemed to be a potentially dangerous situation by the fire inspector, you will be required to correct. 6. Entries are NOT permitted to throw candy, literature, or any other items from a moving parade unit. If you do have something to pass out it must be handed out while walking. This is for the safety of spectators as well as participants and will be strictly enforced. 7. Do not leave your parade entry in the lineup area until you are properly placed by a Lions Club member. 8. Please do not fall behind. Maintain the same spacing, no more than 40’ gap, behind the unit in front of you as you had when you were released from the parade formation site. 9. Walkers must be with a vehicle or float and be able to keep up with parade flow. If not they need to get on their float or vehicle. 10. Performances must be conducted in motion along the parade route. No stopping to perform during the parade. The Judges are stationed near the corner of 16th and “I” Street however you should not stop to perform, please perform in motion.